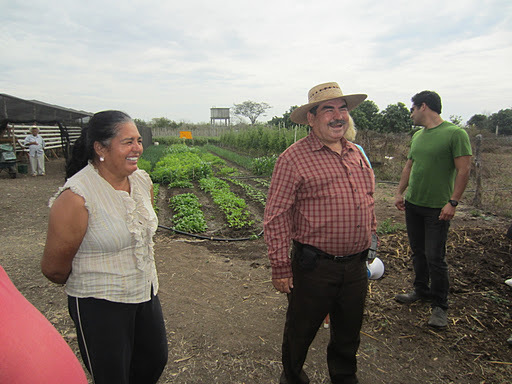 Meseta de Cacaxtla Tour with Conanp – Comunidad Guillermo Prieto | ¡VidaMaz! Lush, delicious, fresh; all they lack is a market. They sadly told us that much of their first-year bumper crop of scrumptious organic tomatoes went unsold! We of course immediately told them about the new Mazatlán Farmers’ Market/Mercado Orgánico de Mazatlán every Saturday morning in Plaza Zaragoza, Mazatlán. The cooperative’s leader, Sra. 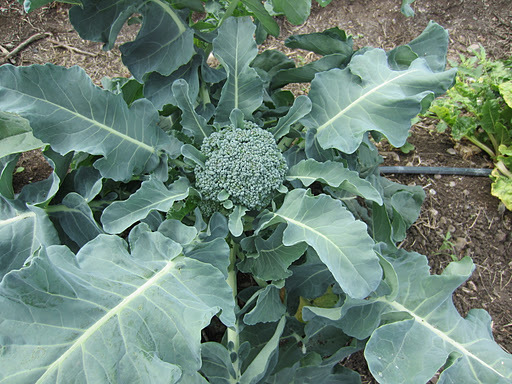 Sacramento, promised they would be here this Saturday to start the application process, so that their organic produce might also be sold there on Saturdays. Sra. Sacramento… a beautiful name, don’t you think? That is her in the photo at left. When I told her she had a beautiful name, she said it’s what she’s been “saddled with” because when she was young her father moved north to tend fields in Sacramento, CA. 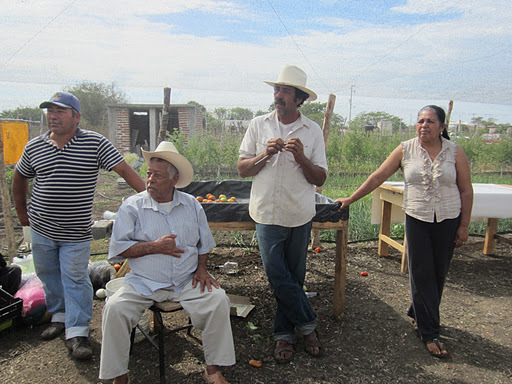 To Sacramento’s left, in the red shirt in the photo, is Carlos Carballo, an engineer, teacher of organic farming, holistic cattle raising, and …. Hydroponics. These farms are located in an area of town that is sort of “off the grid.” The only source of water, other than private delivery by truck, is to have it piped in from Dimas, miles away. The water from Dimas is turned on once a day for two hours. To work around this shortage of water and be able to reuse some the precious water they do have, the community has turned to hydroponics. 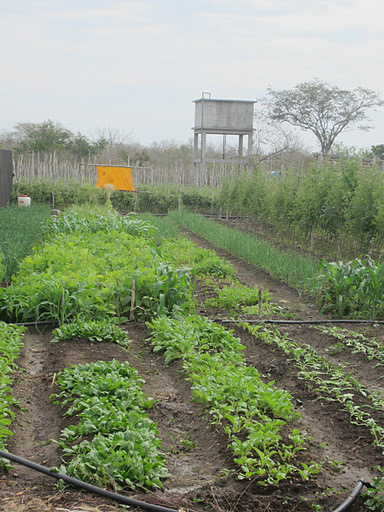 Another difficulty facing the organic farms of Comunidad Guillermo Prieto is that they don’t have a steady market for their product. Traditional planting aggravates this market problem because crops ripen at the same time and need to be harvested quickly. Hydroponics, as we were told, allow the plants to root indoors in a greenhouse, protected from the sun, and provide the farmer a bit more leeway with when to put the plants in soil. 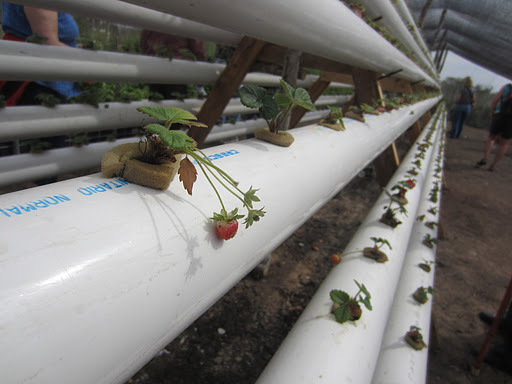 In this way, the cooperative farmers can choose when to transplant a hydroponically rooted strawberry or lettuce plant, and extend the harvest! 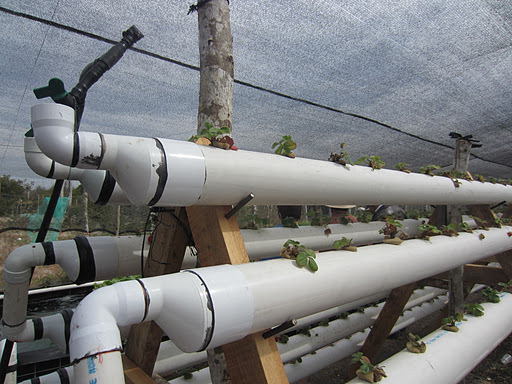 Comunidad Guillermo Prieto uses two kinds of hydroponic systems. The first, as you see above and at left, is a tube system. The engineering uses readily available items (see the rebar holding the piping on the wood support). 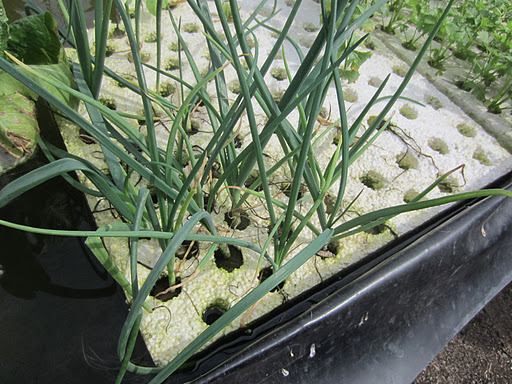 The second hydroponic system we saw here were floating gardens — plants rooting into the water through holes in styrofoam! It was really cool. Four times a day for 15 minutes each time, pumps are turned on to circulate and refresh the water. 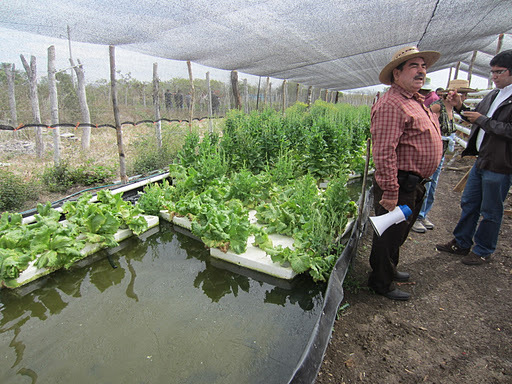 We saw lots of kinds of lettuce, cilantro, and scallions growing in these floating gardens. 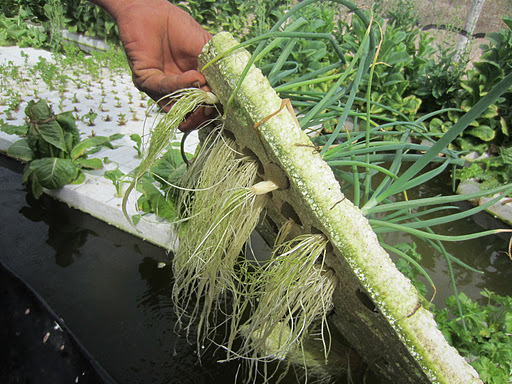 And here in the photo you can see how well the roots respond to the floating garden concept. 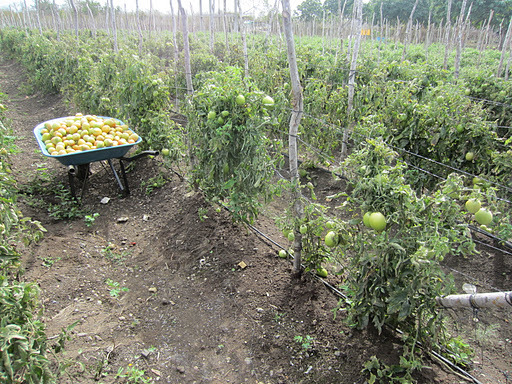 Because the community here doesn’t yet have sufficient greenhouse space or netting, they are unable to vine-ripen their organic tomatoes. If they allow the tomatoes to ripen on the vine, the birds eat their crop. Thus, they harvest them while still green, and allow the tomatoes to ripen inside the netted greenhouse, safely out of the way of the hungry birds. 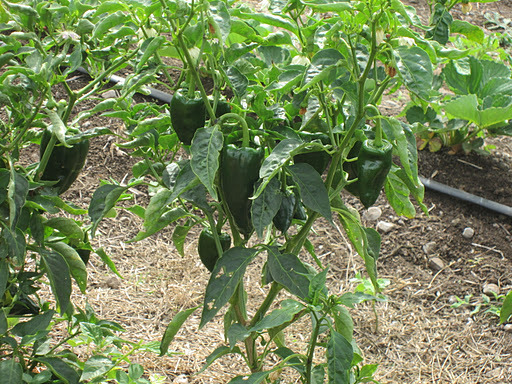 We saw a lot of different crops here, including peppers, camote(sweet potato), cherry tomatoes, and citrus fruits. A bumblebee inside a camoteflower. 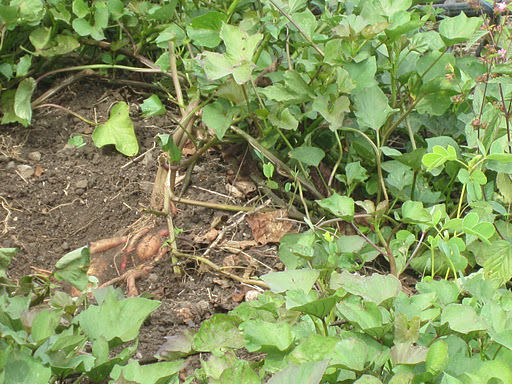 And some camote, peeking up through the soil. Many thanks to our hosts. We weren’t able to spend a lot of time here. I would have loved to have toured the orchards and some of the other fields. As we left I was gifted with a huge bunch of basil and three gorgeously sweet grapefruit. I will be back, to buy some plants and produce, and to visit the terrific people we met. Thank you all! I am really happy to report that yesterday, Jan. 28, Sacramento and her crew were at the Mercado Orgánico Mazatlán. Conanp had submitted all their paperwork, and will be buying them a tent to aid their display. Hooray! So very happy that this trip and this post had a positive outcome in that way. Sacramento was psyched because they quickly sold out of greens and were well on their way to selling out of other vegetables as well. 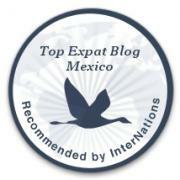 So glad also that MOM/Mazatlán Farmers Market and Conanp are also now in touch. 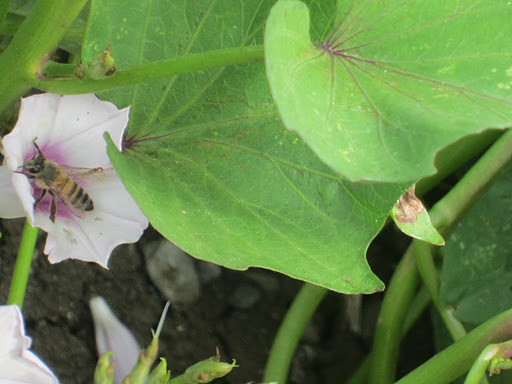 Pingback: A Chance to Visit a Mazatlan Organic Farm | ¡VidaMaz!